A simple way of explaining the term high efficiency is to achieve greater output with less input. High Efficiency Filtration (HEF) is a water filtration technology that produces incredibly clean water with minimal resource requirements. The science of GWT High Efficiency Filtration systems is created through a mechanical particle removal process that traps particles down to 0.5 microns. This removal process is called Cross Radial Flow Technology. In this process, particles are removed to the sub-micron level by combing water over a layer of fine mesh media within the HEF vessel. It’s the unique interior design of GWT HEF Systems that creates the radial flow that moves water tangentially across the media which allows water to pass through the system while trapping harmful particles at the media’s surface. With High Efficiency Filtration, there are no Bags, Cartridges, or Membranes to replace, nor are there any Chemicals, Minerals, or Detergents to monitor or refill. 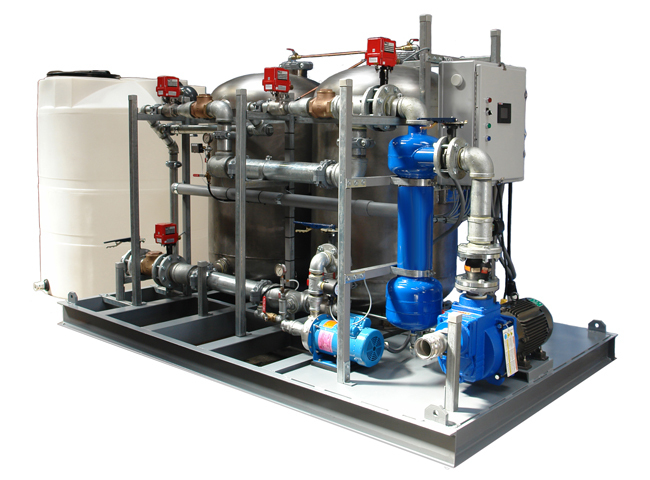 GWT’s HEF Systems are fully automated clean water solutions that remove microbes and other harmful solids from water loops, and reduce overall plant maintenance requirements. Through an automated and energy efficient design, GWT HEF Systems create clean water that filter out >98% of Total Suspended Solids (TSS) on every pass, while saving water, energy, time, and capital resources. Compared to other automated industrial water filter technologies, GWT HEF systems use less water in backwash cycles and require less energy to operate. Capable of treating large volume systems through a side-stream design, GWT Systems provide protection against pitting and fouling to help lower mechanical maintenance & labor costs. Pitting is the formation of small dents, scratches, and abrasions on the smooth-finished surface of machinery and equipment. Pitting occurs when particles within the water collide with the inner surfaces of process or mechanical equipment, leading to advanced wear and premature corrosion. As corrosion increases, rust particles that break free in the process loop further exponentiate the problem by equally increasing the rate of abrasions, leading to more corrosion. . Larger particles in water will fall out of suspension in the water, but agitation in the water itself is what prevents gravity from pulling out the smaller particles that have less overall mass, size, and density. It is the smallest particles (typically ranging from 3.0µ – 10.0µ) that remain in constant motion that gives process water that typical opaque and cloudy appearance . Suspended particles in process loops increase operating costs. Treating the problem in-situ through irregular use of chemical flocculants does little to correct the damage already created within the system. By constantly removing the fine suspended particles consistently entering the water loop, significantly less pitting will occur and the aging affect of equipment will drastically decline. Through sub-micron particle removal, GWT HEF Systems maintain clean and polished systems. Fouling is the result of bacteria overgrowth in a contained water system and is typically recognized by the formation of a colloidal, sometimes odorous substance that develops. Bio-slime, as it is often dubbed, wreaks havoc on the internal surfaces of heat exchangers, cooling towers, and other expensive equipment. Bacteria and other micro-organisms typically range from 0.8 – 3.5 microns in length. Also assisting a colony’s development are the particles ranging from 1-3 microns in size that provide nutrients and other benefits to microorganisms. With a supply of food and an ideal environment, microorganisms will continue to populate and contaminate. If contamination is not properly treated, the bacteria colony levels can grow rapidly. Conventional treatment requires regular dosing of harsh chemicals, toxins, and biocides. By eliminating the bacteria’s primary food sources, GWT systems eliminate a bio-colony’s ability to thrive. Additionally, chemical effectiveness is much better in systems running clean water than contaminated water, which can lower chemical use by 20% or greater.